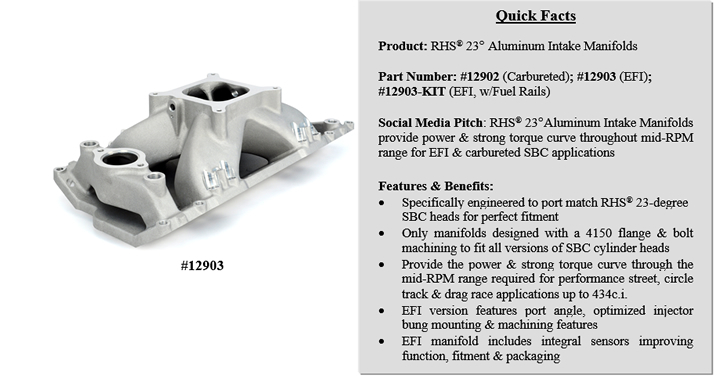 Memphis, TN – RHS® 23° Aluminum Intake Manifolds are designed to provide power and a strong torque curve throughout the mid-RPM range for both EFI and carbureted Small Block Chevy applications. RHS® 23°Aluminum Intake Manifolds are engineered specifically to port-match-fit RHS® 23° Small Block Chevy cylinder heads. Additionally, these manifolds are the only ones designed with a 4150 flange and bolt machining to fit all versions of SBC heads, including classic originals, Vortec GM heads and late model, perimeter-corner, vertical-bolt-style crate engine heads. They provide the power and strong torque curve throughout the mid-RPM range that is required for performance street, circle track and drag race applications up to 434c.i. The manifolds also feature auxiliary water ports, integral water crossover and dual-sided distributor mounting points. Female pipe fittings at all four corners allow external water lines for reverse cooling applications. RHS® and sister company FAST™ have also teamed up to design a revolutionary port fuel injection version of the 23° Aluminum Manifolds. Unlike the competition, the EFI manifold features port-angle, optimized injector bung mounting and machining features. FAST™ engineers laid the injectors down on an angle that points injectors directly at the valve stem. In addition, the EFI manifold features integral sensors improving function, fitment and packaging. EFI versions are also available in kits featuring FAST™ fuel rails with all related mounting parts. Fuel rail mounting stands for either LS2 or LS3/LS7 height injectors are included.